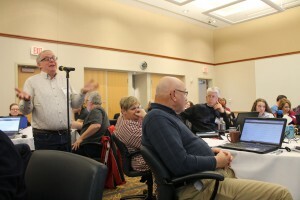 Nearly 50 General Assembly commissioners and Young Adult Advisory Delegates traveled to State College in March to learn about the inter workings of the upcoming meeting in St. Louis. In 1944, a musical about the Smith family’s seasonal experiences hit the box offices. Titled Meet Me in St. Louis, it starred Judy Garland and was eventually deemed “culturally significant” by the Library of Congress. In 2018, the Presbyterian Church (U.S.A.) will gather in the Missouri city for its biennial General Assembly where denominationally significant decisions will be made. With 538 commissioners and 183 advisory delegates available to participate in this year’s 223rd General Assembly, the moniker “Meet Me in St. Louis” is again resonating around the country – and the world for that matter – as Presbyterians prepare to worship, fellowship and discuss the future of the denomination. 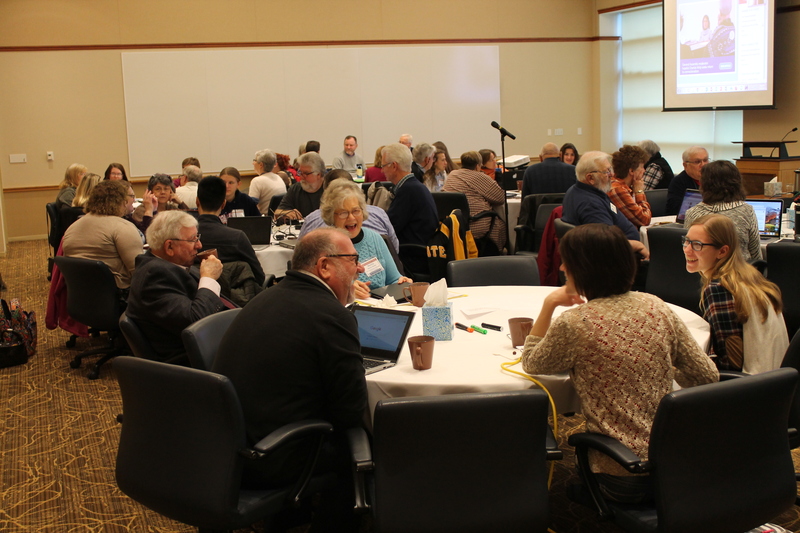 The weeklong gathering will convene with opening worship on Saturday, June 16, continue with committees discussing overtures that bring to light everything from fossil fuels to denominational structure to per capita before concluding on June 23. Among the most anticipated events of General Assembly will be the naming of a new moderator on opening night, an election that includes three teams, including Synod of the Trinity Treasurer and Strategic Ministry Support Chantal Atnip and her vice moderator Ken Hockenberry from the Presbytery of Chicago. For an estimated 80 percent of those who will make the trip to St. Louis, which has hosted the General Assembly 15 times and trails only Philadelphia and Pittsburgh in that distinction, it will be their first time taking part in the activities. 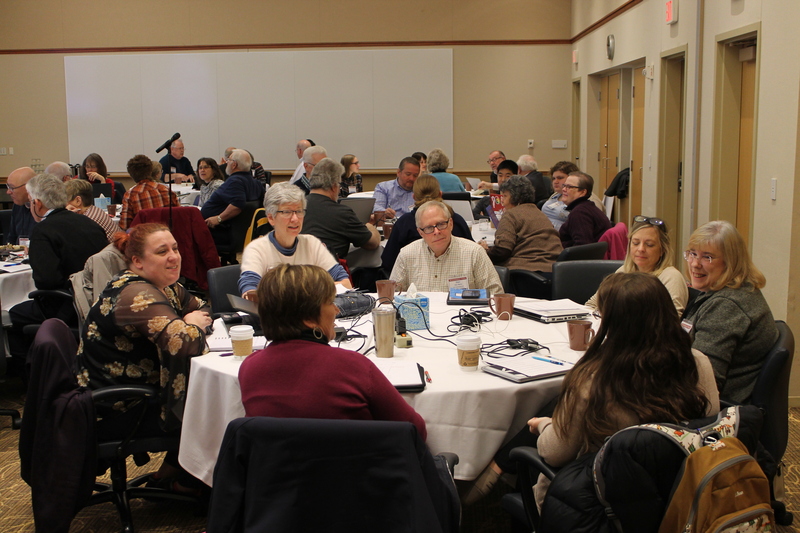 Because of that unfamiliarity, synods and presbyteries around the PCUSA are hosting training events to prepare their representatives for the week. 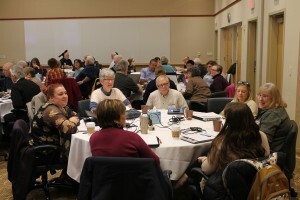 The Synod of the Trinity held its training March 10 in State College, PA, where nearly 50 GA commissioners, Young Adult Advisory Delegates (YAAD) and other planned attendees came together to learn about the inner workings of General Assembly. There was both excitement and trepidation among those who traveled to the Penn Stater Hotel and Conference Center on that Saturday morning. In an attempt to prepare them with insight on how the assembly will function and inform them of the content, Synod of the Trinity Stated Clerk Wayne Yost, Presbytery of Carlisle Stated Clerk Jim Speedy and Presbytery of Huntingdon Stated Clerk Ginny Rainey spoke about everything from polity to the PC-Biz website to bringing a sweater to the convention hall. Tom Hay, the Director of Assembly Operations for the Office of the General Assembly, also joined the group by video conference to provide helpful tips on what to expect in St. Louis. Commissioners and YAADs discuss concerns and interests related to the upcoming General Assembly meeting. Nicole Vogel from Lehigh Presbytery is also eagerly anticipating sharing a pew with Presbyterians from around the country. “I’m most excited about getting to do the worship aspect of it,” she said. For someone like Miranda Prough, a YAAD from Huntingdon Presbytery, the unfamiliarity of the proceedings will be an eye-opening experience for her. Pittsburgh Presbytery’s Rebecca Abbott is ready to roll up her sleeves, dig in and get to work through her commissioner role in St. Louis. Rebecca’s focus will be on an overture about mental health issues, something that is very near and dear to her heart. “I’ve come to find that mental illness actually runs way more rampant in our churches than I would have ever imagined,” she continued. “I thought at first I was going to be the only one and it was something that I couldn’t share with people at my job, my church or my family. I’ve come to find out it’s a really big issue. For those who will be experiencing the unknown, General Assembly could be a bit overwhelming. For Allen, who is facing some physical health challenges, he is hoping that he won’t be limited in St. Louis. “My nervousness is mostly about whether I will be able to successfully attend and to faithfully execute the responsibilities,” he said. Dan Mertz, a GA commissioner from the Presbytery of Huntingdon, asks a question during a training program for the General Assembly. Rebecca admits that meeting new people will be a bit of an obstacle for her when she begins her work on a General Assembly committee. Nicole’s curiosity will center around how a couple of issues will be handled at the General Assembly. “Per capita is pretty interesting, if it’s going to be that much of an increase, and the Middle East stuff,” she said. Miranda’s focus will be on the fossil fuel discussions. For Allen, he’s interested to see how the denomination continues to evolve and move forward. It’s something many others will be intrigued with as well. Note: Commissioner and advisory delegate resources are also available through the PCUSA here.